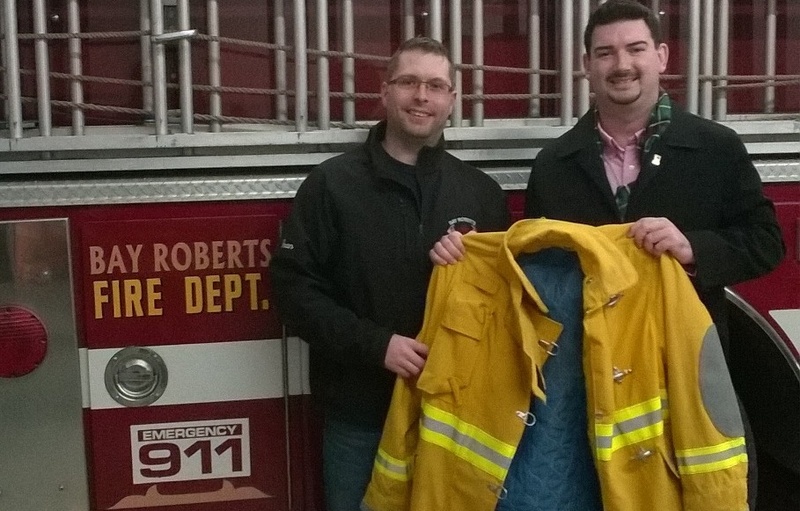 The Bay Roberts Fire Department is a shining example of answering the call and doing their utmost to protect personal property and save lives. I had the privilege of visiting this Department on November 1st, meeting Fire Chief Norman, firefighter Dean Franey and Mayor Wood. I was given a tour of their Department, discussed equipment, sharing of services and gained a much broader understanding and appreciation of the work they do to serve a large population of more than 6,000 people in conjunction with their Municipal Council. I arrived in Bay Roberts after a significant loss on the Great Northern Peninsula when a cornerstone business of Hillier’s Automotive was gutted by fire in St. Lunaire-Griquet in October. In a newspaper article, Deputy Fire Chief Humby had highlighted their lack of protective fire suits as a major concern for their growing department members. He highlighted the Firettes, would be raising money to try to purchase eight suits that were needed. I sent this information our via Twitter and was surprised to get a response from Bay Roberts Fire Department saying they may be able to be of assistance in helping St. Lunaire-Griquet with their need. It was a wonderful feeling to be able to accept on behalf of St. Lunaire-Griquet Fire two full bunker suits and third jacket. This was an amazing contribution by Bay Roberts and illustrates their giving spirit and the importance of helping those who have a need. It was very pleased to see they had a Memorial space dedicated to firefighters in the Town, who have passed away and also the Heritage Society have posted interpretative panels. They still have their number one fire truck since the 1946, which gets used in parades, but not for active service. This type of initiative could be replicated in other Towns and Departments to give recognition to those who give their service 24 hours a day, 365 days a year. Fire Chief Snow became a new dad and was at the hospital for the delivery upon my return to the District and I wanted these suits to be with the Department as soon as possible, as one never knows when a fire call may strike. 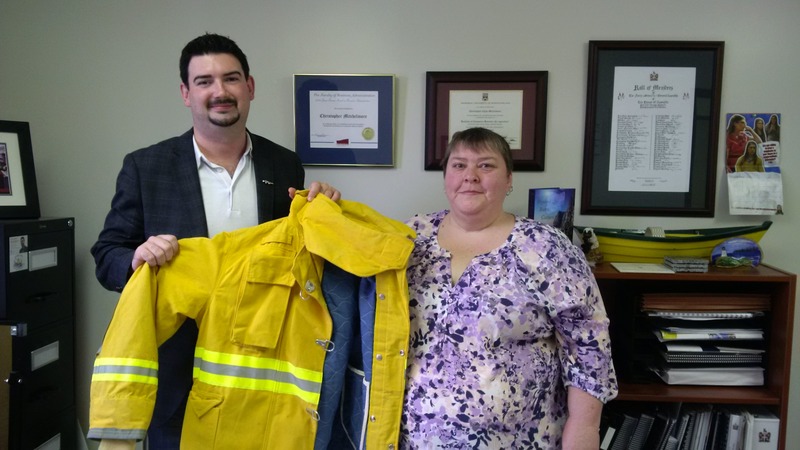 I presented President of the Firettes, Mona Snow with the bunker gear. This will help them greatly with respect to their fundraising goals for the remaining suits they need. A tour of Bay Roberts illustrated a vibrant Town with respect to tourism, fishery, small business, growing sub-divisions, a planned business park and community economic development initiatives such as festivals. I enjoyed seeing the Mad Rock and network of walking trails, well-marked signs and a visit to the Mad Rock Cafe for a delicious meal. I would highly recommend a visit and look forward to a return in the near future. The Town of Bay Roberts is poised for future growth and ideally located to capitalize on future opportunities. They are also capitalizing on the use of social media with active Twitter accounts, Facebook Pages and a visually appealing website to keep people informed and engaged. Towns, organizations, business or volunteer groups not active on Twitter and Facebook should consider adopting. It’s a New Year! I want to extend a thank you to Bay Roberts for your kindness, hospitality and generousity. Bay Roberts, like the Great Northern Peninsula, is a place you will want to experience. Posted on January 8, 2015, in Business, Community Economic Development and tagged bay roberts, business, community, fire, fire department, Newfoundland, St. Lunaire-Griquet, tourism. Bookmark the permalink. 1 Comment. Great stuff – useful on many levels. All best for 2015.